A 16-year-old driver and an adult passenger who bailed from a stolen vehicle after crashing into a police cruiser have been arrested. The driver, Jeremy Patrick Hager of the Dundalk, is being charged as an adult, along with 19-year-old Derek Darnelle Stroman, also of Dundalk. They've been charged with first-degree assault, second-degree assault, second-degree assault of a law enforcement officer, reckless endangerment, unlawful taking of a motor vehicle, grand theft, malicious destruction of property, unauthorized removal of property, and rogue and vagabond, a count related to stealing from a vehicle. Both are being held at Baltimore County Detention Center on denied bail status following an initial bail hearing. Baltimore County Police say they received a call for a suspicious vehicle just after 5:30 p.m. on Monday in the 8100 block of Shore Road in Dundalk. A check of the car's tag showed it was a red Jeep Liberty that had been reported stolen from the 8000 block of Del Haven Road at 8:30 a.m. Monday. Two patrol cars and an unmarked vehicle responded, blocking Shore Drive with emergency equipment as the Jeep approached. Police say Hager accelerated towards the police cars, striking one of the patrol units hard enough to disable it. The Jeep drove off before stopping a short distance away since it too had sustained disabling damage. The Jeep's six occupants then fled on foot. Additional police units responded, including a K-9 unit, establishing a perimeter to search the area. 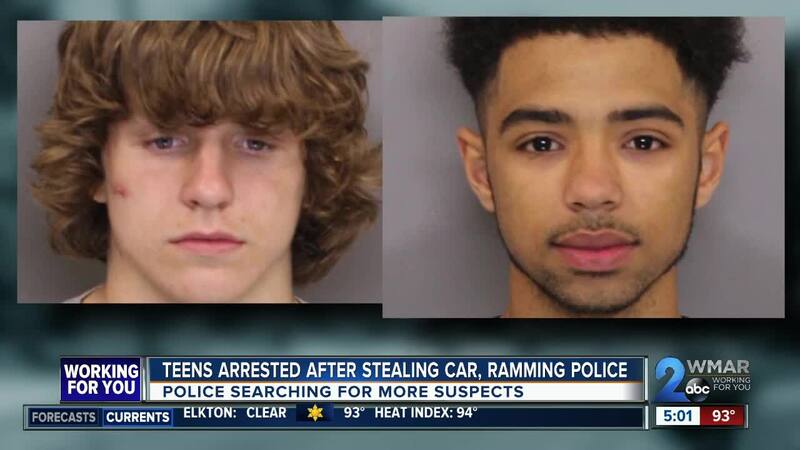 Hager and Stroman were apprehended in the area of Lynch and Dineen Streets. Four suspects remain at large. No officers were reportedly injured. Bail review hearings for Hager and Stroman will be forthcoming.